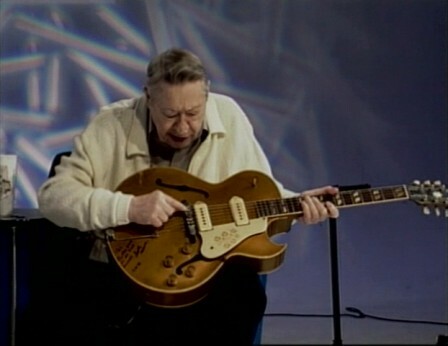 Scotty traded in his Fender Telecaster in 1953 for this Gibson ES 295 to Ed Fitzpatrick, the president of the O.K. Houck Piano Co. located on 121 Union Avenue in Memphis. He used it initially with The Starlite Wranglers and then primarily on tour and all but the last Sun recordings with Elvis. 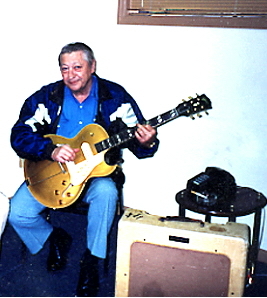 He traded it in on July 7, 1955 at Houck's for a Gibson L5. 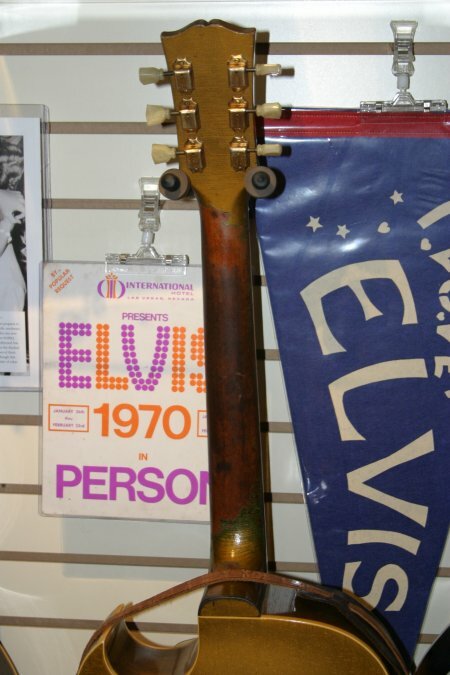 Jimmy Velvet, a longtime friend of Elvis Presley's and collector of memorabilia had this to say about the guitar "I purchased the guitar many years ago for $6,000.00 and it was sold in the early 90's for $125,000.00. 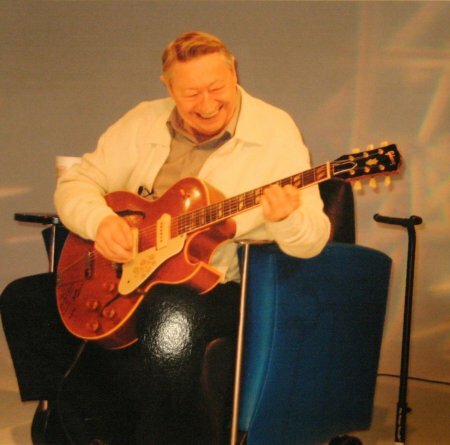 Years ago I showed Scotty the guitar and he verified that it was in fact the guitar he traded at a Memphis music store for a new guitar he was purchasing. 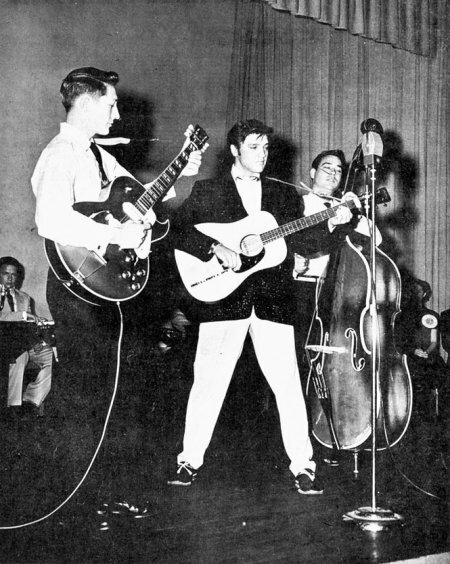 The guitar as when I had it was featured in the book by Lee Cotten titled: The Elvis Catalog, Published by Dolphin-DoubleDay in 1987 it's on page 35." 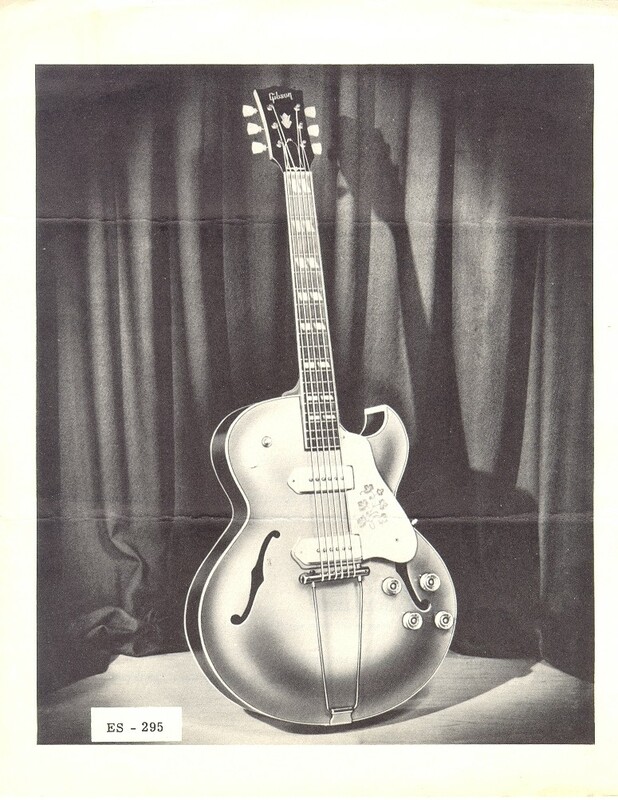 Gibson produced the 295s from 1952 until 59 (58 last production version but several made in 59 for a Summer show), reintroduced them in 1994 but has since discontinued them again.. 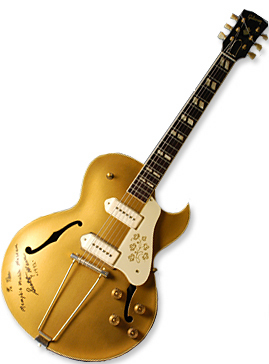 They were essentially a fancified ES 175 with Gold (Bronze metallic) finish and floral pickguard. 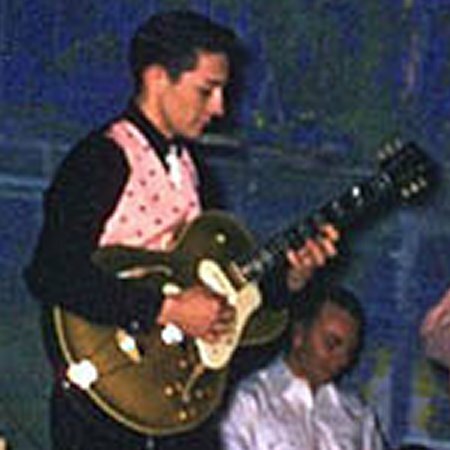 They featured a single sharp cutaway body, multi-bound maple top, f-holes, raised white pickguard with etched flowers, maple back and sides with a mahogany neck, 19 fret* bound rosewood fingerboard with pearl parallelogram inlay, trapeze wrap over tailpiece (Scotty's was not stock**), black painted holly wood veneer peghead with crown logo inlay, 3 per side tuners with pearl buttons, gold hardware, 2 single coil (P90) pickups (P.A.F. Humbuckers for the last few produced in 1958), 2 volume/2 tone controls, 3 position switch. 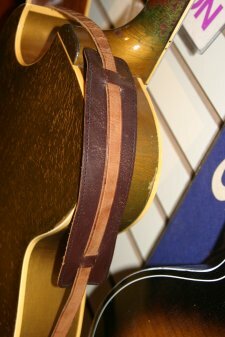 Scotty used to use a "Bobby Lee" style guitar strap with his guitars in the '50s. 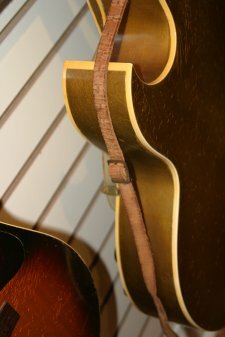 He would attach it with the bottom strap button and loop the other end around the headstock, as was customary with many players at the time. 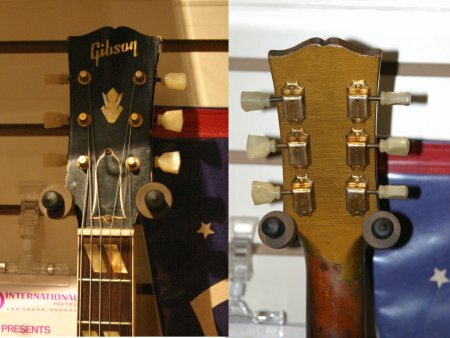 The strap with the guitar now appears to be the one Scotty had originally, as near as he can tell. 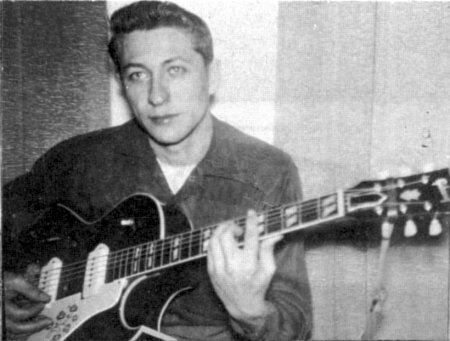 The bridge on Scotty's ES295 is a "Melita Synchro-Sonic" as used on a lot of mid-'50's Gretsch guitars. 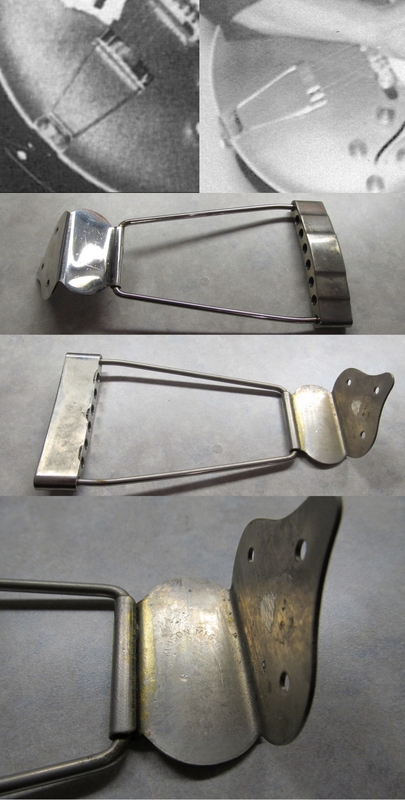 He had this and a Kluson made tailpiece as used on ES125s and other guitars of that era put on his early on to facilitate more accurate intonation of the guitar. 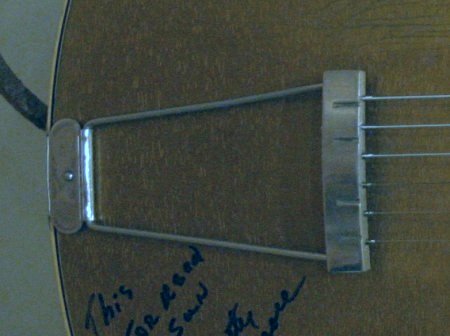 The tailpiece now on the one believed to have belonged to Scotty appears to be of a similar design seen on some older National archtop guitars and almost identical to ones made in Japan and used on some Japanese models exported to the US and UK in the late '50s and '60s. 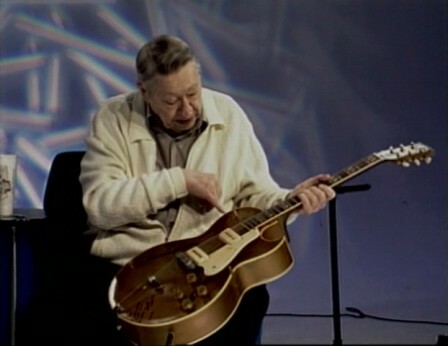 Around 2007, Larry Moss, the Memphis area collector who currently owns the guitar, arranged for Scotty to sit down with George Klein and his original ES 295 to talk about it for a video. 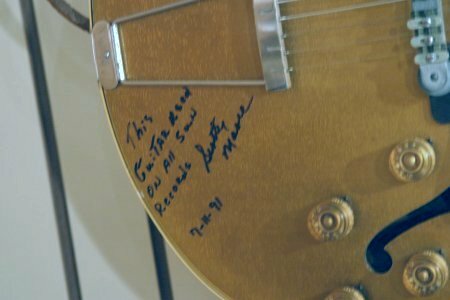 It was the first time he had seen it since Jimmy Velvet owned it and had signed it as the one used at Sun, and the first time he played it since trading it in 1955. 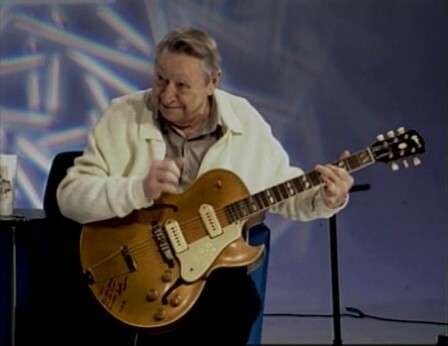 Even though Scotty only played an ES-295 during the very early years of his professional career his name has literally become synonymous with the instrument. Through the years he's been asked to autograph more than a few though and he's done so with the stipulation that they not imply that he owned them or played them.1 At least two autographed by him (7-19-91) were on display at the Hard Rock Cafe's in Dallas and Nashville. 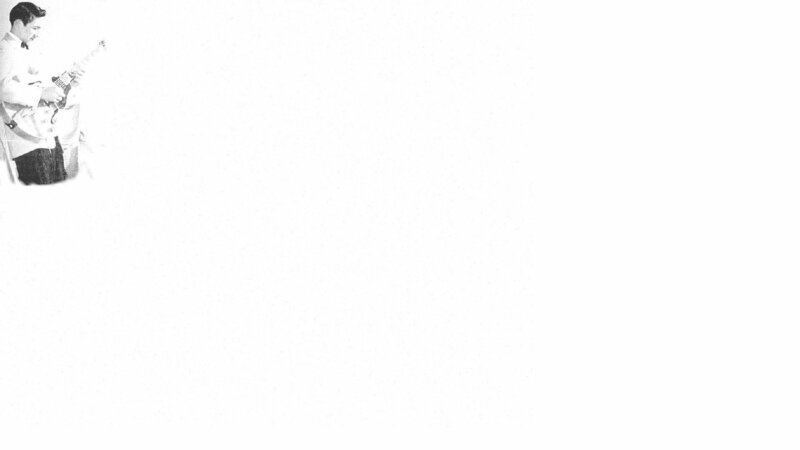 *A.R. 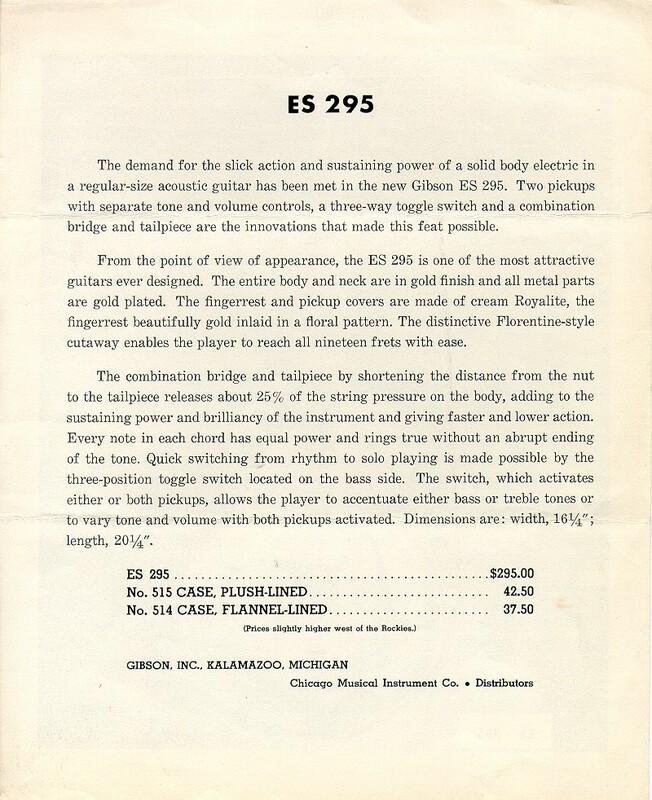 Duchossoir's book "Gibson Electrics: The Classic Years," lists a transition date of 1955 from 19 frets to 20 frets. In actuality several examples exist that suggest a transition that began sometime in 53 with no real consistency. However they do give production numbers of: 1952=297, 1953=637, 1954=357, 1955=166, 1956=193, 1957=71, 1958=49 totaling 1770. 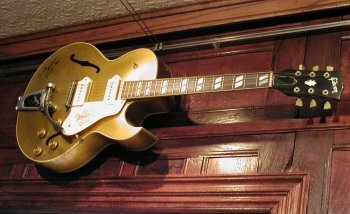 ** We initially believed Scotty's ES-295 to be a 1953 model based roughly on the calculated time frame when he had bought it. 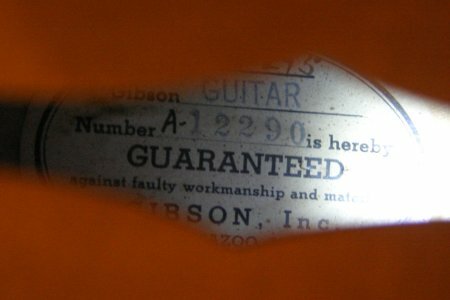 After checking the serial number against Gibson's Bluebook of Electric guitars has revealed the guitar to actually have been manufactured in 1952. The two model years, at least, have the same specifications. 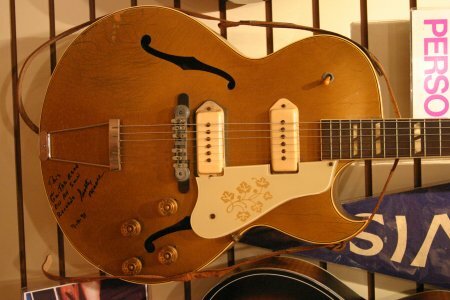 At one time we were told that Danny Gatton had purchased a 53 ES295 that he believed had originated from Memphis. 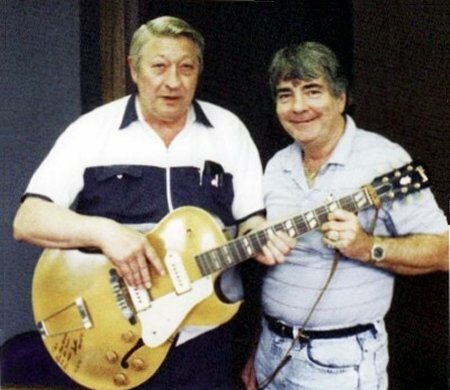 Scotty has been contacted several times about that guitar and the claims but has maintained that it is not his, never was, and definitely not one he played on any Sun recordings. This had been resolved when Danny was alive but unfortunately the rumors persist. 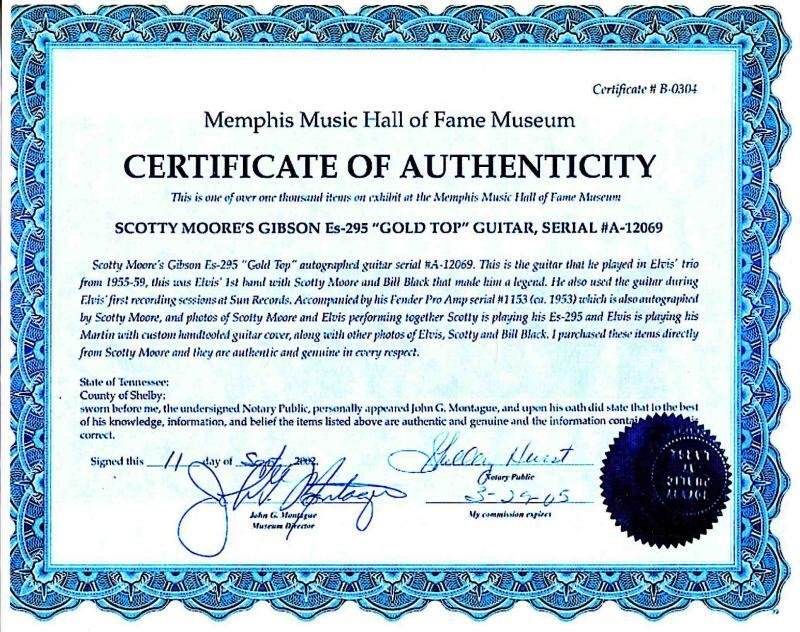 1 In 1992 Scotty was requested to autograph an ES-295 and a Fender Pro amp by John Montague for display in a Memphis Music Hall of Fame. He agreed to with the stipulation that the instruments were not to be misrepresented as having belonged to or played by him. 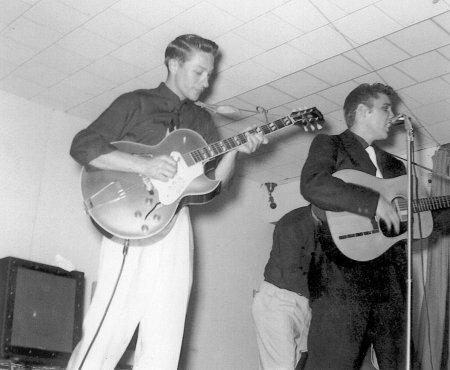 The guitar was a 1952 bearing serial number A12069 and the amp number 1153. 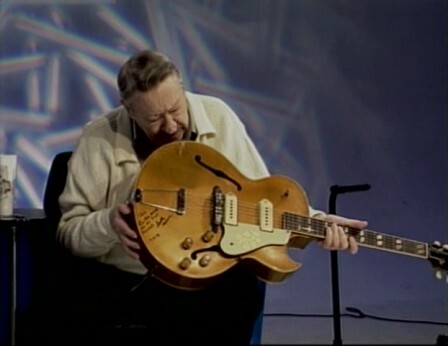 In 2002 the instruments along with a COA from John Montague were sold on eBay under the misrepresentation as being Scotty's. 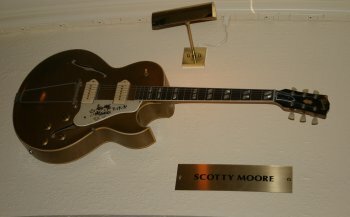 The instruments were bought by the Love Street Gallery in San Francisco and sold separately in 2003 as Scotty's. Each may have changed hands several times and when contacted we've attempted to set the record straight. 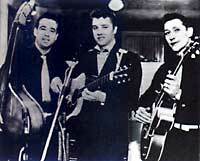 Once and for all, the instruments were not Scotty's, were never played by Scotty and never on any Elvis recording.